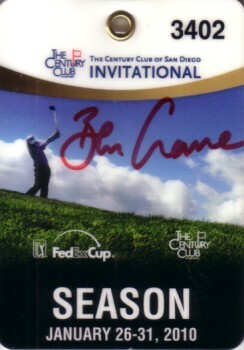 2010 Century Club Invitational plastic season badge autographed in red marker by PGA Tour veteran Ben Crane, who won this event played at Torrey Pines outside San Diego. MINT. ONLY ONE AVAILABLE FOR SALE. Obtained in person. With certificate of authenticity from AutographsForSale.com.